Without getting too fancy and complicated, good leadership involves charting a course, motivating followers, and leading them effectively to attain a stated objective. To summarize: an effective leader defines a vision and then aligns, develops, and motivates others to achieve a desired goal. Ok. So granted Jesus could be classified as a good leader, what does a good shepherd have to do with it? The Lord is my shepherd, I lack nothing. He makes me lie down in green pastures, he leads me beside quiet waters, he refreshes my soul. He guides me along the right paths for his name’s sake. Even though I walk through the valley of the shadow of death, I will fear no evil, for you are with me; your rod and your staff, they comfort me. You prepare a table before me in the presence of my enemies. You anoint my head with oil; my cup overflows. Surely your goodness and love will follow me all the days of my life, and I will dwell in the house of the Lord forever. This Old Testament psalm, written 1000 years before Christ, has been identified as Messianic, picturing Jesus who is later defined in the New Testament as the good shepherd (John 10:11) and the great shepherd (Hebrews 13:20). But wow, what a leader! A leader of leaders. A leader/shepherd that provides, moves, leads, refreshes, and guides David (and by extension, you and I) on a path he has chosen. Even one that is fraught with difficulty and darkness. As a follower of this great leader/shepherd, David is encouraged and comforted, even fed in the midst of enemies and obstacles. David is anointed with favor to the point of overflow. He (David) is confident this good, great and loving leader/shepherd will sustain him and leave an enduring imprint on him for the rest of his life. Shepherds must care for their sheep, even to the point of great sacrifice in time, effort, money, or their life. Sheep do not “just take care of themselves” – they require endless attention and meticulous care. 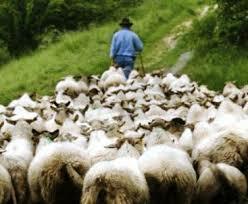 Human mob instincts, fears and timidity, stubbornness, stupidity, and perverse habits all parallel that of sheep. Sheep are content and calm in the physical view and presence of a good shepherd. Sheep will not lie down as long as they feel in need of finding food. Sheep have little or no means of self-defense. Sheep will drink contaminated water even on the path toward pure streams. A cast or fallen sheep cannot be righted by itself. Too much wool can cause a sheep to become cast, literally weighed down with its own wool. Left on the ground, the sheep will die in hours or days. Sheep grazing will erode the land; the best safeguard is to keep the flock moving, rotating the fields. The best fields for sheep are on higher ground; the best route to the mountain top is always through the valleys. A shepherd’s staff or rod is the most important tool he has. It is mostly used for sheep welfare; namely, discipline and protection. The shepherd leads the way and clears the paths, fields and streams of overgrown brush, leaves, and debris. Flies, gnats and flying parasites will infest the noses and flesh of sheep, driving them literally to beat their heads on rocks and trees, even unto death. Olive oil mixed with sulfur and spices was an old remedy in Palestine for fly and parasite infestation. While people like sheep have their issues, I don’t believe the parallels are absolute. Nevertheless, modern leaders today can learn from this low and humble vocation. Indeed, a Shepherd/Leader with their exercised 1) guidance, 2) commitment, 3) assistance, 4) encouragement, 5) protection, 6) path-leading, 7) discipline, and even 8) love, possesses attractive attributes and characteristics of one who can cast a vision and shepherd the troops in an uplifting and effective attainment of a desired goal. Are you a good shepherd/leader? 1 A Shepherd Looks at Psalm 23, by W. Phillip Keller, Zondervan, 1970, 2007.